Your pet rabbit needs a safe and secure home with plenty of room. Whether your bunny lives in your home or outside make sure you have everything necessary to keep him happy and healthy. Your pet’s cage should be at least four times the size of the rabbit. Wire mesh flooring can cause injury or sore hocks so a solid flooring is better for your pet. Do not use glass cages or aquariums as they do not provide enough ventilation. An area for the litter box should be provided. There are many commercially available cages designed for rabbits. Remember, bigger is always better when it comes to the living area of your pet. A rabbit’s outside hutch should be several feet off the ground and at least 30 x 36 x 20 inches. A top opening often works best for handling and try to have your pet’s home as big as possible. It should provide an enclosed nesting area with straw or hay for your pet to relax and sleep as well as a solid floor through part of the cage that will help prevent foot injury and sore hocks. The hutch should be weatherproof and be able to protect your bunny from extreme hot or cold temperatures. A stoppered water bottle or bowl is needed as a source of fresh water. Outside rabbit’s may need fresh water more frequently due to increased drinking during warm weather or the freezing of water in cold weather. Your pet’s home will need someplace for his food. A food bowl for rabbit pellets and a feeder for hay will help keep your bunny’s cage and food clean. 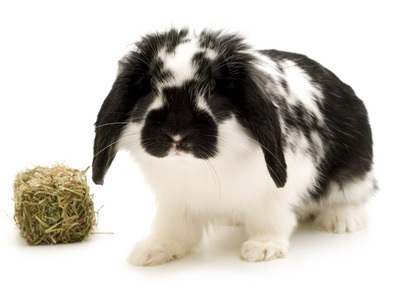 Your pet rabbit can be trained to use a litter box. So you should have a litter box as well as litter. Litter from recycled paper is a good choice. Your pet may eat some of the litter so do not use clumping cat litter. Rabbits need ways to be entertained just like everyone else so make sure you include plenty of toys. They love ramps, steps and platforms to play and exercise on as well as toys that can be pushed and tossed around. You should also include some chew toys since rabbits love to chew and the toys will help wear down their teeth.